Save Me, Time-Travelling K-pop Boy Band, You’re My Only Hope! 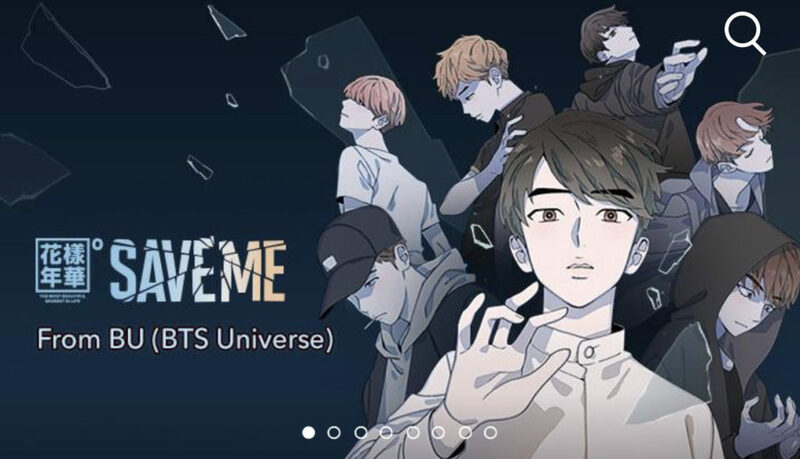 “Save Me” BU (BTS Universe) has launched on Webtoon! So far, so good. But who are these seven boys, you might wonder—and what… on earth… is the “BTS Universe”? It’s okay! You wouldn’t be the only one, especially if you’re not living in South Korea or the United States right now, where BTS Fever is hitting epidemic proportions. “BTS”, or ‘Beyond the Scene(/Bangtan Sonyeondan)’ is a K-pop boy band that’s been climbing the global charts with their blend of traditional K-pop, hip-hop and R&B since 2013. What makes them particularly interesting from our perspective isn’t necessarily the music, but the other endeavours which have grown their fame – a series of interconnected music videos, short films and books exploring the lives of fictional characters based off the seven singers in the band (V, Suga, Jin, Jungkook, RM, Jimin and J-Hope) which officially began in April 2015. Happier times for our dashing protagonists. ‘Save Me,’ Episode 1. Like the more familiar Marvel and DC movie/comic franchises, the BU seeds its outings with little easter eggs and suggestions of details in the wider fictional setting. Viewers familiar with the band will undoubtedly have noticed how many of these little features tied to the characters we are introduced to in the “Save Me” Webtoon prologue. 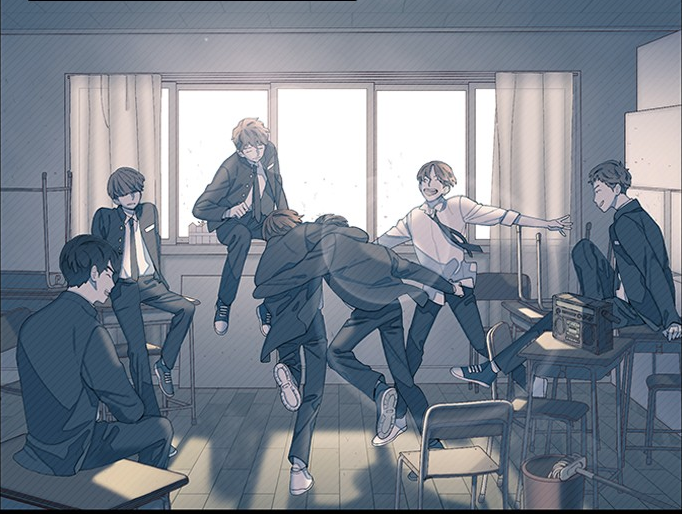 This is due to the fact that “Save Me,” drawn by Webtoon alumnus “Lico,” (also of Refund High School fame) is set to intertwine with the events of “The Most Beautiful Moment In Life (Parts 1 and 2),” one of the earliest BU storylines. 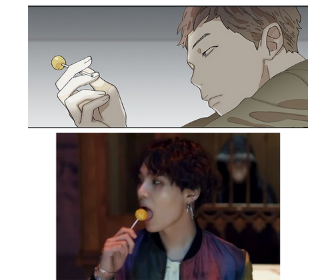 Yoongi still hasn’t finished that Lollipop yet?! Comic panel from “Save Me” Prologue; cinematic still from “Magic Shop,“ the book tie-in of which went on to become a Korean best-seller. It’s early days yet, and though it might be impossible to see where this Webtoon will go and how wide its circulation will be once the dust of novelty settles (though we can probably be certain that it’ll bring the idea of Webcomics roaring even farther into the mainstream, which can only be a good thing! ), early impressions show great promise—and with the absolute juggernaut of BTS and their promotional partner ‘Big Hit Entertainment’ running behind it, you know that it’s going to be pushing for excellence the whole way through. What did you think of this first chapter in the BTS Webtoon adventure series? Are you excited by the potential that this type of multi-media, multi-platform storytelling has to offer, or do you think the K-pop sensation should just stick to their music? Let us know in the comments below or over on Facebook and Twitter, and until next time, remember: Don’t eat the clickbait! This entry was posted in News and tagged Bangtan Sonyeondan, Big Hit Entertainment, BTS, BTS Universe, BU (BTS Universe), J-Hope, Jimin, Jin, K-Pop, Lico, RM, Save Me, Save Me BTS Universe, Save Me BU, Save Me Webtoon, Suga, Terence MacManus, V, webcomic, webcomics, WEBTOON by The Average Joe. Bookmark the permalink.